When I attended Wairarapa College I took a professional course especially designed for students who wanted to go into business. It was called Academic Three and differed from Academics’ One and Two by substituting the language courses with something more suited to our future endeavours. Latin and French were replaced with bookkeeping and commercial practice. Our main tutor for these two subjects was Mr Brown and I remember him telling us that the world of commerce was transacted in American dollars and the English language. He therefore advised us to take as much notice of our English teacher as we did of him. “To be able to express yourself well in English is as important in your pathway to a successful business career as knowing how to keep accounts and understanding the rudiments of commercial practice” he would intone. I wonder if the same advice is given today. We know that there is a texting language that debases English to such an extent that two words can become just two letters and whole phrases can be expressed in acronyms. The language on the street is punctuated by expletives that make even me blush and when some young people of both genders open their mouths I cringe at the profanity and lack of diction. There is an enlightened debate going on as to whether students today should be taught Te Reo from an early age which is probably appropriate in the current contentious climate, just as Latin and French was in our time. Maori are justifiably concerned that many of their people are in the lower end of the socio-economic scale. This discrepancy needs to be addressed and I can understand them wanting us all to learn their language, but in the 1950s black and white world of Mr Brown it would have been considered that there was no economic rationale to do so. Losing the Race explores the three main components of this cultural virus: the cults of victimology, separatism and anti-intellectualism that are making blacks their own worst enemies in the struggle for success. 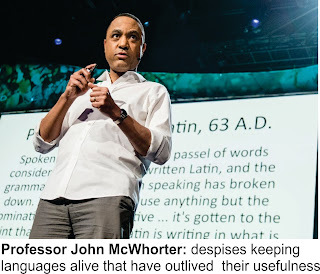 There are obviously parallels for us here and in another context McWhorter writes that he despises the desire for keeping languages alive which he says have often outlived their usefulness and ought not to be sustained by artificial means. He believes a multiplicity of languages encourages segregation and ultimately apartheid. I’m not suggesting for one minute that the Maori language or Maori culture has outlived its usefulness; far from it. It’s part of what defines us as an exciting nation and is largely why we are admired from afar, but to create economic success may mean encouraging our young students to embrace English more emphatically. Like it or not, we are judged by our peers and we risk revealing the hitherto hidden incapacity to express ourselves comprehensively the minute we open our mouths.